This two-year old SlashFood article showed up in my Paper.li today, retweeted by a brewery I follow. The article, Super Bowl Sunday — The 8th Biggest Beer Day of the Year? questions the list of the top eight “Holidays/Events for Beer.” The list was complied by Nielsen, and as he points out is “combined beer sales from all U.S. outlets (including food, liquor, convenience and drug).” He’s initially is skeptical about why sales for the week following the holiday/event are also tracked, but eventually figured out that’s just how the weeks are tracked. If you want to include a week in which the holiday falls on a Sunday, you have to include the week prior and the week of to get all the relevant sales data. Author Mike Pomranz drew many of his conclusions from his correspondence with Nielsen executives, who naturally have a healthy bias in favor of their own data. As a result, Pomranz may not fully appreciate two additional tidbits about those statistics. First, Nielsen’s data is almost entirely chain store sales. The big supermarket chains, drug stores, big box stores, convenience stores. As such, it’s a big slice of the pie, but it’s still nowhere near the whole pie. Missing from its numbers are thousands of small independent outlets that sell beer. It works because the sample is the same from period to period and so comparisons and trends can be confidently teased out of the data, and it’s certainly useful, but it doesn’t tell the whole story. What most people outside the industry forget, IMHO, is that it isn’t intended to be all-inclusive. It’s purpose is to identify sales trends and big picture activity. When I was the beer buyer at BevMo, I’d see an endless parade of Nielsen data from various breweries, and each would tell a different story, simply because of the way the information was massaged. There’s so much data that it can be drilled down in endless ways, with each business doing it in a way that was most favorable to their purposes, to show their sales in the best possible light. So it should be taken with a grain of salt. It’s most useful when comparing the same set of data over different periods of time; weeks, months, quarters, years, etc. But it tends to break down when comparing different time periods, as in this list, because there are so many more factors that the raw numbers can’t capture. Pomranz certainly gives seasonality its due, concluding that “[i]f you were to normalize sales to account for weekly seasonal changes in overall beer sales, the often beer-centric celebration of the Super Bowl would most likely move significantly up the list.” That’s because climate — the weather — plays a HUGE part in beer sales that can’t be overstated. When the thermometer ticks up, beer sales go up. When it’s time to put on a sweater, beer sales plummet. It’s always been very seasonal that way. But even my old bosses at BevMo failed to recognize its importance and would routinely blame me for poor beer sales (or at least not hitting sales goals) when forces out of my control would hurt the amount of beer people bought. I even had one person tell me I was essentially not allowed to blame the weather, which is a bit like saying you can’t explain getting wet by pointing to the rain. So not surprisingly, the top four holidays all take place during warm months of the year. 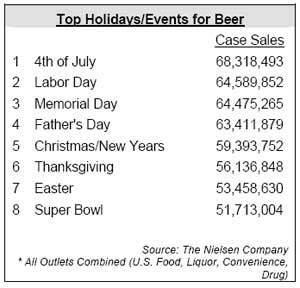 And while you don’t normally associate Father’s Day with big beer-soaked picnics, just the fact that it’s in June may account for increased sales. Frankly, Easter is likewise one of those holidays that few people have been able to tie in with beer, but as it usually comes in the spring, it could also be a coincidence of the season. Second, the Nielsen data is for “Case Sales.” In other words, not kegs. And a lot of holiday or event parties include kegs. For example, every year I was with BevMo our number one weekend for keg sales was Halloween. But in the Nielsen data, it doesn’t even crack the top eight. To me, that suggests another one of the limitations of their list. It’s just common sense. You can’t tell me more people drink beer for Easter than Halloween. Again, that’s because the data is imperfect and not comprehensive. It’s just a snapshot of one particular portion of the beer market. And in fact, one year later, in 2010, the very same Nielsen chart for the subsequent year has the Super Bowl now in 7th place, with Halloween in 6th, and Easter and Father’s Day no longer registering. So while I think we can mostly agree on which holidays or events are the biggest in terms of beer drinking, even if the order they’ll fall in will vary slightly, it’s best not to rely too heavily on incomplete data that’s not intended to be all-encompassing of the total beer market in America. Very astute observations. statistics lie. Hey, Jay. Thanks for your further exploration of the points in my old blog post. I think it’s worth pointing out that the conclusions I drew from the Nielsen statistics were not based on personal opinion or speculation, but came from an email interview with people who worked at Nielsen (as stated in the article). I also think it’s unfair to say that I “touch” on seasonality, being that I conclude, “So there you have it. If you were to normalize sales to account for weekly seasonal changes in overall beer sales, the often beer-centric celebration of the Super Bowl would most likely move significantly up the list.” That said, it’s great to get additional feedback from someone who actually worked in the industry. You definitely opened my eyes to some additional things here. Best, Mike.